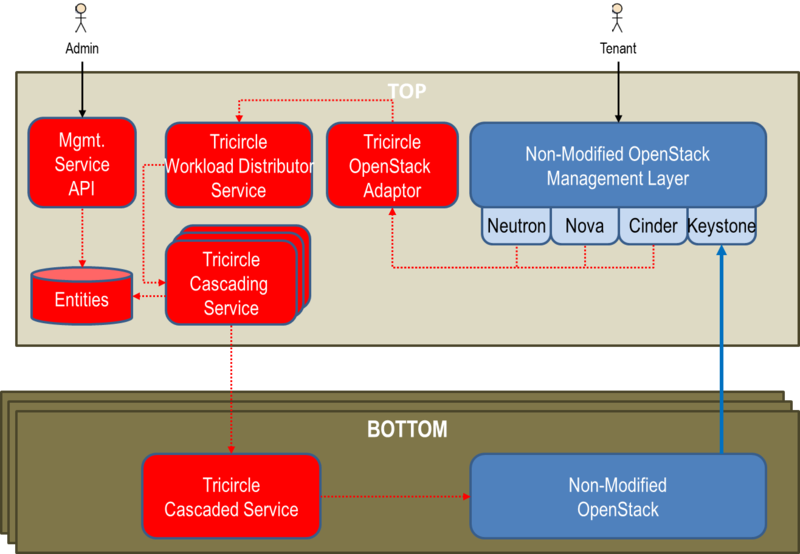 In this series of posts, we would be diving into "Tricircle"
- an open source project that promises to give a "single pane of glass" management over multiple OpenStack environments, using a cascading approach. As more and more companies are deploying OpenStack, it is becoming clear that there is a need to be able to manage multiple cloud installations. The reasons range from application lifecycle management, through spill-over scenarios and all the way to multi-site Disaster Recovery orchestration. So why would one care to deploy the same service over multiple environments? ... (feel free to share additional incentives in the comments). Managing multiple OpenStack instances could be done in several ways, for example by introducing multi-site awareness into each project in OpenStack (which we ruled out due to complexity of evolving all OpenStack projects to do it). The approach we took in Tricircle was to add a "Top" management OpenStack instance over multiple "Bottom" OpenStack instances. The "Top" introduces a cascading service layer to delegate APIs downwards, and injects itself into several OpenStack components. So, how does it feel to use such a "Top" OpenStack instance? 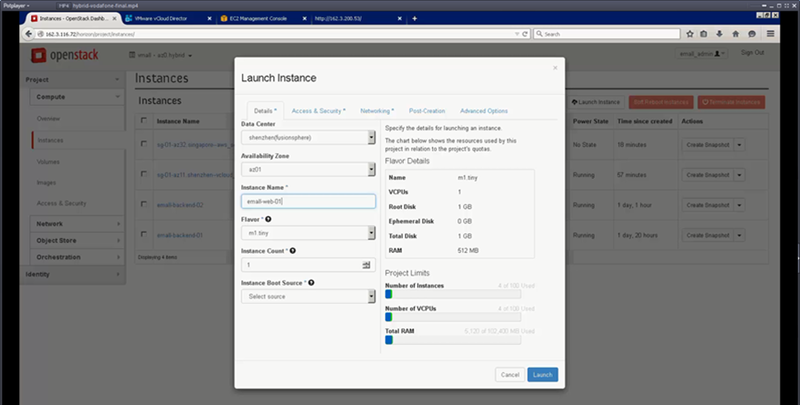 For the "User", it is pretty straightforward: when you launch a VM, you get to choose from a list of Data Centers (a new drop box in Horizon), and then from a list of Availability Zones based on your Data Center selection, and that's basically it. For the "Admin", you get a new "Add Site" API (in CLI only, at this point), and you need to have substantial knowledge about the "Bottom" sites you are adding (credentials and network-related information which we will cover in the next post). 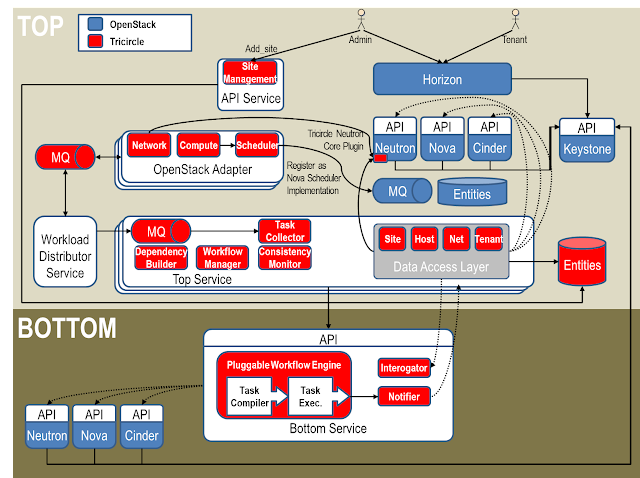 deployment without any additional requirements (OpenStack API compatible). For the top layer we used a non-modified OpenStack API layer to intercept operational requests and handle them in the cascading service. At some point, we plan to let the admin decide how to expose the "Bottom" sites, e.g. different AZs on the "Bottom" site, or all the actual "Compute Nodes", etc. This will create a complete decoupling between the Adaptor and the "Cascading" service. We assume that the "Bottom" sites are unmodified and potentially heterogeneous (in terms of network, configuration and version). 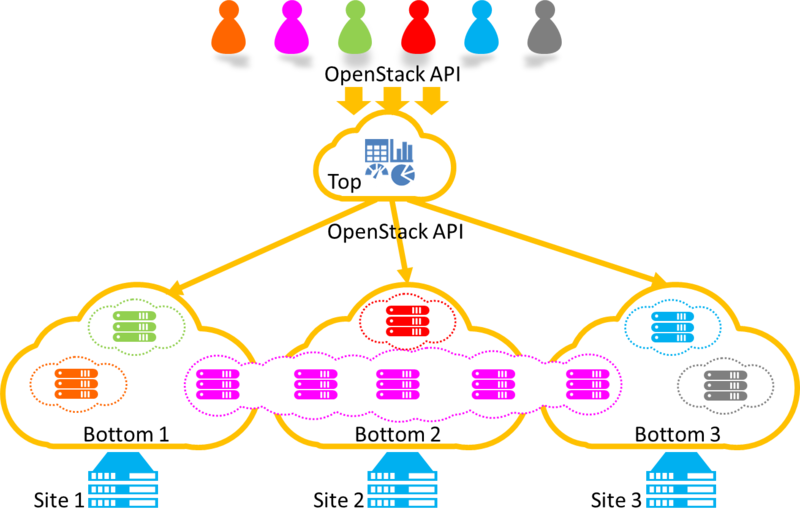 At this stage, our design assumes a centralized Keystone service running on the "Top" (we are planing "Federated Keystone" in the future). In order to add a "Bottom" site to the multi-site environment, the admin needs to deploy a "Cascaded" service, and register it in the "Top" site, using a special "add site" API. Then, configure the "Bottom" site to use the "Top" Keystone. From the user experience point of view - We hope it is. In our coming posts, we will dive into resource synchronization, the cross-site networking, explain how we tackled the status and notification updates and share our approach to meeting large scale deployments. Please share your thoughts about this in the comments. We will be talking about this project in the upcoming OpenStack Tokyo summit, so if you're coming there, be sure to attend our talk.